What does this game bring? Blackjack Surrender is a great option for those who are struck by bad luck. As the name suggests, players are given the option to surrender and lose the game, but also keep half of their bet amount. This blackjack variation is usually played with six decks of cards. However, sometimes a four deck variation can be found at the online casinos. This game allows the dealer to peek for blackjack; however the dealer stands when receiving a soft 17. This is an interesting blackjack variation, with a relatively low house edge, which gives the players an opportunity to safe themselves after being dealt a really bad hand. 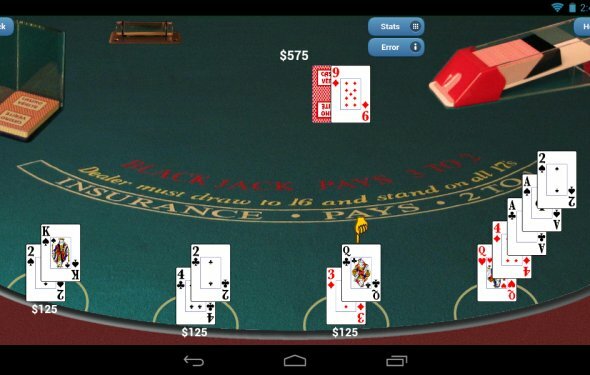 Depending on the game developer certain rule modifications can be found when playing Blackjack Surrender. First of all, the regular rules for playing blackjack apply to this variation, unless there are highlighted exceptions. The game is usually played with six decks of cards and the dealer stands on soft 17. The player can double on the first two cards, as well as double after splitting. However, splitting is allowed only once. The table setting is similar to all the other blackjack games. The dealer first deals two cards to himself and to the player. This is when the player has the opportunity to place a side bet in case the dealer holds an Ace; the dealer is always allowed to peek for blackjack. Additionally, the player can choose to hit, stand, split or double. Of course, if the player has a very bad combination of cards he can take advantage of the surrender rule and give up his cards alongside with half of the initial bet amount. If the player is dealt a pair of cards, he may split them once. However, the player cannot resplit nor hit split Aces. If the dealer or the player goes over 21 they bust and lose the game. Same as all blackjack games’ objective, in order to win the player should beat the dealer’s hand by hitting a blackjack or having a bigger amount than the dealer. The house edge of Blackjack Surrender depends on the number of deck with which the game is played and certain rule variations, such as whether the dealer hits or stands on soft 17 and if player can or cannot resplit Aces. For example, in a Blackjack game played with six decks, where the dealer stands on soft 17, the player can resplit for four hands and resplit the Aces, the house has an edge of 0.25%. In contrast, when everything is the same, yet the player is not allowed to resplit, the house edge increases to 0.39%.